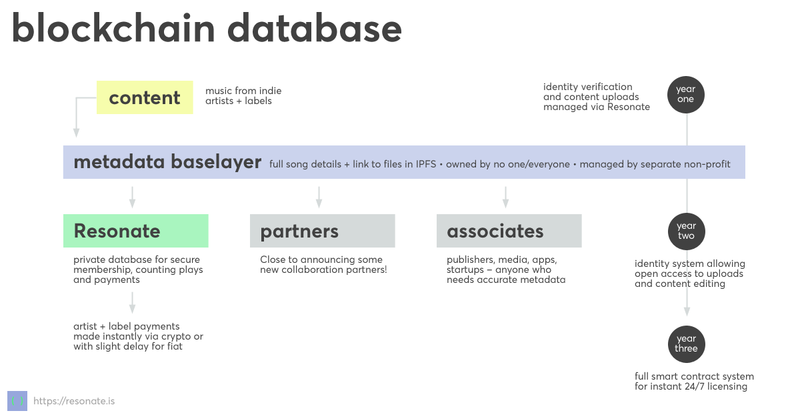 In this doc we’re going to take a look at a broad overview of our plans for building a blockchain for the music industry. If you have no clue what a blockchain is, then start with our articles on metadata and licensing and scenarios for DJs and producers. After participating in Imogen Heap’s Mycelia project, becoming as an acting member of Berklee’s Open Music Initiative and co-organizing a week-long blockchain lab for Music Tech Fest one thing has become crystal clear – overly ambitious blockchain projects are doomed to fail. Why? Trying to mash up one of the most complex technologies against an even more complex industry is nothing short of a moon shot. It’s actually like trying to launch several rockets from different locations on Earth, which may or may not then join in the upper atmosphere to then either continue on towards the moon or divert course for… Mars. That’s what led us to the following strategy which is visualized in the graphic above. This publicly accessible blockchain will act as a decentralized IMDB for music, operated separately from Resonate itself, in partnership with various organizations. Owned by everyone and no one. Administered by a separate non-profit organization needed to steward its growth and development. Content seeded by Resonate artists, indie labels and other key partners. This is one of the key aspects of the project that separates us from other blockchain initiatives – we’ve decided NOT to pursue identity in the first stage. Identity on the blockchain is as serious as a heart attack. Unlike Bitcoin, where if you lose your wallet you just lose your money, with a content-based blockchain losing access could also mean losing future royalties and control over an artistic work. So in this first stage, access to the database will happen through Resonate, where we’ll verify identities and assist with edits and updates. Built after an exploratory stage involving workshops, events and possibly university-led research projects. Creating an identity system that works for a totally decentralized, open-access database is complex in the extreme. Imagine Wikipedia without any editors, or IMDB without anyone in charge of granting/restricting access to profiles and you can being to imagine how messy this is. Know any experts in Game Theory? We’ll need some scary smart experts in order to visualize solutions to numerous scenarios and solutions… identity hacking, crowd-based verification, cryptokey vault storage systems and more. This is where things get really interesting. A full-on smart contract system where licensing happens 24/7 and payments are routed around the world instantly. Led by a worldwide team of experts to create a robust, flexible system for managing the complexities of music licensing. Imagine a band writes a song where the full track can be licensed for indie movies only, but remixed versions without the vocals are available to be used in commercials for a select range of foreign territories. Then add in about a hundred other scenarios and you’ll begin to see why this stage is being done last. If you’re a developer (with or without direct blockchain experience) we’d love to collaborate with you! Also open to discussions about partnerships with other music organizations as we’re going to need a lot of logistical support to bring this system to life.